The Fourth of July isn’t a holiday in Italy, but that doesn’t stop this American from celebrating with hamburgers, hot dogs and mmm, maybe even some apple pie (Mom’s here, remember?!). and buon weekend a tutti! I hope you and your mom have an amazing 4th. Apple pie? molto gelosa! 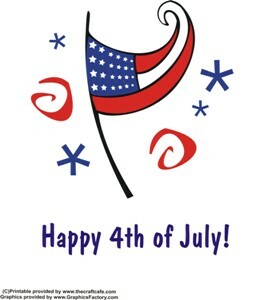 Hope you all have a great celebration of the Fourth -even if you are so many, many miles away! Home is where the heart is -even if it is only for a day! Jeni Hill Ertmer’s last blog post..CELEBRATE! A Great Date! Happy 4th of July! Have a great day and enjoy all the yummy bbq fare! Joanne at frutto della passione’s last blog post..Raspberry orange yogurt pops! Have a great 4th of July. Hope you have some fireworks to go with that pie!!!! No fireworks on the 4th, but as luck would have it, we have a religious festival tomorrow, so there will be lots tomorrow evening…let’s hope we don’t start any forest fires…. mental mosaic’s last blog post..Tacos and Trifle for 4th of July! D’oh! I completely forgot about the apple pie. Fortunately, our grocery stores never ever close. God bless America (and Safeway). sadira’s last blog post..Happy 4th Of July! So it’s not exactly apple season, right? So what are you using for your pie apples? In spite of all the gorgeous farmers’ markets that make me drool in abject covetousness every time you show a picture of them, do you in Italy also eat the same fruit out of season from halfway around the world year-round that we do? I thought that was just an American thing. Our apples come from northern Italy (the ones in the pie were from Südtirol (Alto Adige)), where at least some types are grown year-round apparently b/c they’re certainly available year-round (thank goodness–I *love* apples). Bananas (also not grown in southern Italy) are the only other fruit that is coming to mind that we can get pretty much anytime. Well, lemons are pretty ubiquitous as well, but that’s because we’re surrounded by them. So apples in the apple pie! Woohoo! Any holiday that focuses on coffee is a good holiday! Thanks Barbara; we had BBQ spare ribs too! YUM! when you make your apple pie…. Your advice is well-taken 😉 Hope you had a great holiday! I hope it was lovely! ‘Twas indeed Jen; hope yours was lovely as well.